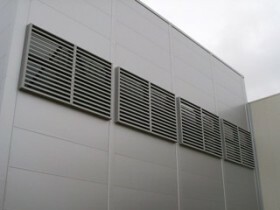 Nationwide Louvre Company supply and install high quality Acoustic Louvres. 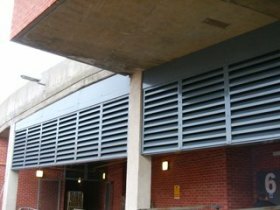 Our Acoustic Louvres are manufactured in three standard depths, 150mm, 300mm & 600mm (single and double banked) and a 300mm deep high performance chevron acoustic louvre. 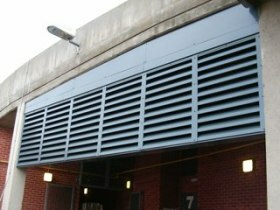 The overall sizes of our Acoustic Louvres are made to the customers requirements. 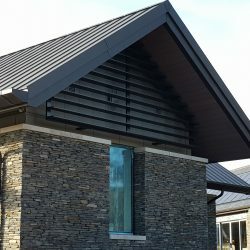 Nationwide Louvre Company can supply Acoustic Louvres to almost any opening size, in factory manufactured modules and steel mullion support frames. 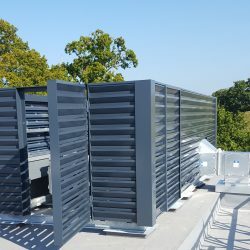 Nationwide Louvre Company have designed, manufactured and installed acoustic louvres, acoustic enclosures, acoustic booths and acoustic louvre screens all round the United Kingdom. 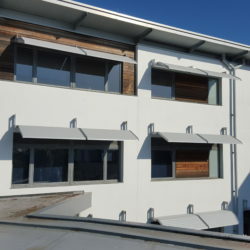 With the increasing need for quieter air conditioning systems and mechanical services Nationwide Louvre Company manufacture acoustic louvres to meet the modern architects and consultants requirements of aesthetically pleasing looks whilst meeting the buildings services requirements for airflow and noise reduction. 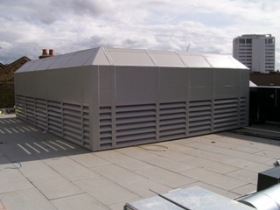 The acoustic louvres have been tested by an independent consultant to BS2750. 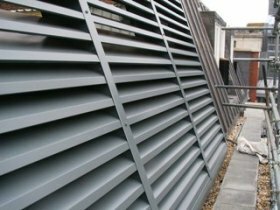 All of our acoustic louvres are designed and manufactured in-house by design engineers with many years experience. We are not restricted to standard sizes. This means each acoustic louvre is tailor made to meet the customers opening dimensions and installation requirements. 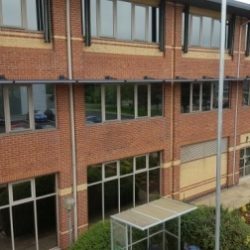 We offer a comprehensive service with our acoustic design which ensures you receive the best possible advice at planning stage, thereby avoiding site problems at a later stage. 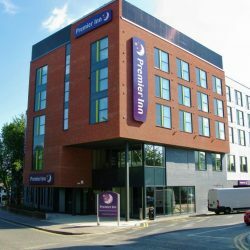 On large louvre assemblies / screens our engineers work in close liaison with the customer from quotation and design to order stage and through manufacture to delivery and if required, organise our own highly experienced fitters for the installation of the acoustic louvres on site. Nationwide Louvre Company are CHAS accredited and safety audited. The standard acoustic louvre is 300mm deep manufactured from 1mm thick pre-galvanised mild steel up to a maximum size of 2400mm x 2000mm. Larger sizes are available made up in modules. 12 x 12 x 19 swg bird mesh is fitted as standard (optional insect mesh or weld mesh). 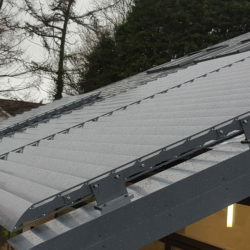 The standard double banked louvre is two single units back to back making the louvre 600mm deep manufactured from 1mm thick pre-galvanised mild steel up to a maximum size of 2400mm x 2000mm. Larger sizes are available made up in modules. 12 x 12 x 19swg bird mesh is fitted as standard (Optional insect mesh or weld mesh). Fixing: As per the single Acoustic Louvre. Frame and blades are manufactured from 1mm thick galvanised mild steel or aluminium. Each blade in the air stream has an acoustic infill covered by 0.7mm thick perforated or expanded galvanised steel sheet. The blades positioned on a 150mm blade pitch. 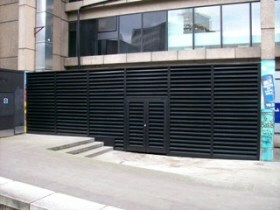 There are no standard sizes for the acoustic louvres as each louvre is tailor made to meet your requirements. When specifying the size, we require the actual opening dimensions as we allow a tolerance to ensure the louvre fits into the opening.